Sam’s friend Ben came to stay with us two weeks ago and as a thanks, he secretly rang up the butcher near our flat in Peckham and bought us some meat to cook. What a wonderful present! When he was here, he and I went for a walk and I talked to him about food shopping and the things he liked to buy at butchers and fishmongers where he lives in Edinburgh, and also, about the disappearance of fishmongers and butchers from areas of Edinburgh that are becoming rapidly developed and different. I hadn’t really thought about Ben going to the butcher or fishmonger before and it put him in a different light in my mind, hearing him talk about what he chooses and how he likes to cook. Sausages were something that Ben mentioned he always likes to buy, and actually I don’t often buy, so I thought of him when making this and it turned out really well – a good omen! Add the olive oil to the pan and then the grated onion and pounded fennel. Cook for a few minutes, then add the finely-chopped bacon, and stir for a minute and then the garlic and chilli flakes. Add the sausage meat again and the tomato and stir for a minute, then add the alcohol and simmer for two -three minutes. Then add the cream and stir. Add half a cup of water anda good pinch of salt and simmer gently, so it’s just bubbling for a further 30 minutes with the lid off. Taste for seasoning and adjust accordingly. Allow to cool a little before serving. Heat up the water or water-milk mix until it’s almost boiling, then gradually stir in the polenta while whisking vigorously on a low-medium heat. Keep whisking or stirring with a wooden spoon for a few minutes, then add two walnut sized lumps of butter and a few torn sage leaves. Keep stirring and add more water or milk if it becomes to stiff. Season well with salt. 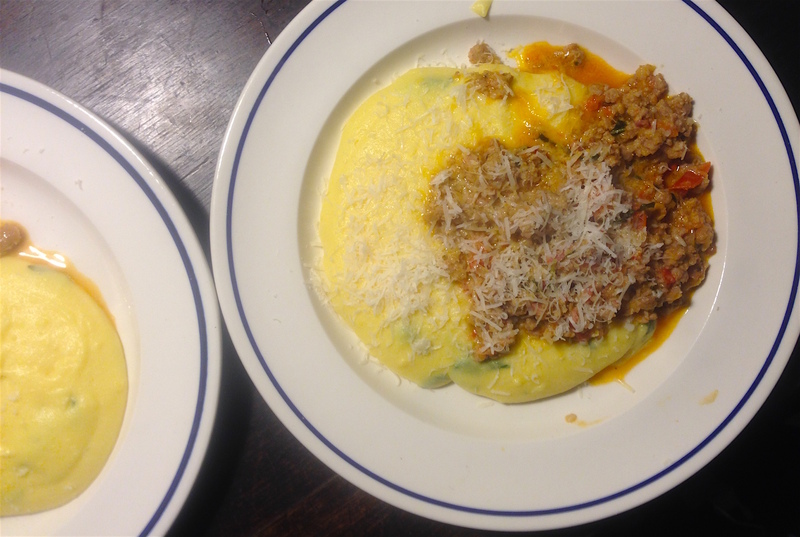 Serve on a plate with the ragu and plenty of grated Parmesan.